When I was doing my planning for the year, one thing that had me scratching my head was what we would use for a timeline. We started on our second four-year cycle, and we had filled our Book of Time from Sonlight. I wasn’t sure if I wanted to try something different. I also looked at History Through the Ages Record of Time from Homeschool in the Woods. They offer a beautiful timeline book and CDs of printable figures, both of which I may still use at some point. Brief caveat: I realize that I titled the homemade timelines “History through the Ages.” This is merely because that is what it is… I am in no way trying to steal the title from the fine folks at Homeschool in the Woods. So, I grabbed a couple of handy, dandy sketchbooks, some colored pencils and a ruler and got to work. Then, since I am using Tapestry of Grace as an outline for our curriculum choices this year, I printed out their beautiful Map of the Humanities, which TOG generously offers for free download here. Too bad my color printer was on the fritz… the map isn’t quite as beautiful as it was intended to be. That’s better… Anyway, I adhered it to some pretty green paper and scored it to fold into itself. Then, I glued it onto one of the first pages in the timeline book, so the kids can refer to it as we move through history. Voila! 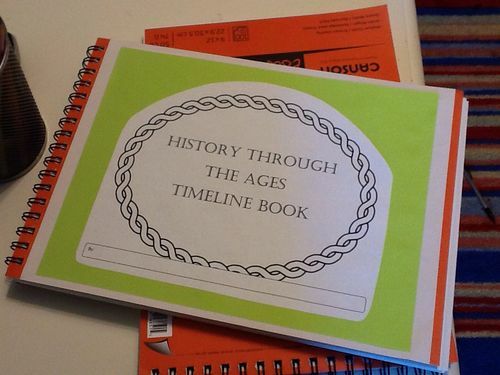 A cheap and (relatively) easy timeline book that the kids can customize. This is also a project that your kids can make themselves. The labeling of the time periods can get a little putsy, but you can certainly split that up into different sessions, instead of ding it all at once like I did. Happy crafting!